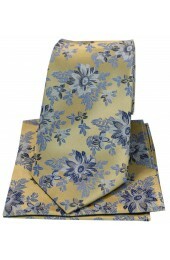 Posh and Dandy Bright Gold Flower Design Luxury Silk Tie. Seven fold ties using only the most luxurious silks complimented with wool inner lining. Highest quality silk yarns used and most original designs produced.